I paid about $550-650 including shipping from Andrew Cozens . He owns a rx-7 new/used parts store in England (good guy to deal with). That is probably about the average price for the rear seat conversion. They are quite hard to find, and are even rare in Japan... so do not expect the price to go down in the near future. It is a very easy conversion, and the US model already have all the hole ready for the installation It is really just plug and play. There is not a lot of room back there, so if your friend are big ... they will be cramped. I am able to put my son and his cousin (4,9 years old) back there and they have plenty of room. It really all depends on how far up the front seats are. I will say that it is one of the best mods you can do to your car ... it becomes unique, and I have had a car dealer offer me $18,000 for a car I bought for $12,500 so it will increase the resale value. How many 2+2 3rd gen. rx-7 are out there?? Of course I have a few goodies invested in it as well: Intake, dp, mp, ecu. The point being, I will surely get the money out I invested (1994 rx-7 with 49k) because there are many people who will not buy the 3rd gen. because there is no rear seat (like me). 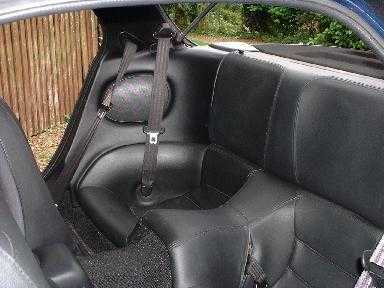 The seat kit should come with everything you need to convert your car ... even full seat belts (no just lap belts). The only modification you will need is to the rear shock tower. You will need to drill and tap a hole for the rear seat latch. The car was stamped at the location, but not drilled from the factory. Some people have chosen not to attach the latch and the seat is just fine (I did). The rear cargo carpet will need to be lengthened to cover the back of the back of the rear seat. I simply went to a local scrap yard, found a piece of carpet that match the carpet in the back, and glue it onto the back of the rear seat (it looks great). The last tidbit that you should know is that the jspec carpet is not cut the same way the american carpet is cut. So since the rear inside panels are different, there will be a area by the floor that will need a carpet patch. Again a easy fix with some spare carpet. There are some paranoid people out there how will tell you "that the seats are not legal (DOT approved)". This is true, they are not DOT approved. They are definitely made of the same quality as everything else in the car. The rear seat belts are even make the same as the front. " The RX-7 is not made for 4 people", again this is true... it is clearly stamped on the door that the car is only a two seater. "The car can not handle 4 people (weight capacity)", again this is true to an extent. The car's weight capacity is also marked on the door (I believe 350lbs). I weight 165, my wife 110, my son 35, and his cousin 90 for a grand total of 400lbs and the car still drive like a dream. The wheels are no where near touching the wheel wells, if fact I can not notice a difference in height. Even with another 25-50 lbs of food in the back. "You will get sued buy anyone hurt in the back seats" this may be true in some states. I have explained my rear seat conversion to my insurance company (State Farm) and they have no problems with it, in fact they have put a note on my file stating it. So here in the great state of Michigan, I am covered. I bought a rear seat from the same guy, nice guy and a pleasure to deal with. I have a couple of things to add though. My 93 R1 is not stamped to accept the rear seat back latch, this is the latch that will hold the rear seat back vertically. I got the carpet from the rear of the 4 seat FD about 2 weeks after I had the seat installed, the factory US carpet fit but it was about 1-2" too long, and did not have the piece to cover the back or the rear seat back. I DO have the rear carpet out of the 4 seat donor car now and it fits just fine.